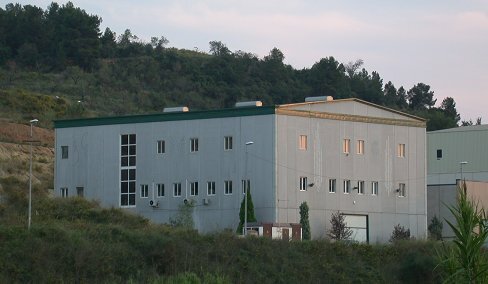 Our shop has a dynamic team of 18 professionals. Collaboration between all of us is the basis for our achieving harmony which we hope is expressed in each and every one of our instruments. 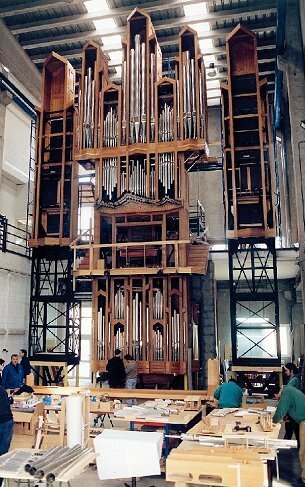 Just like the organ, we are always evolving, synthesizing North German influences, (Gerhard Grenzing is originally from that region), but our instruments are also an outcome of other countries and their traditions, especially those areas bordering on the Mediterranean. 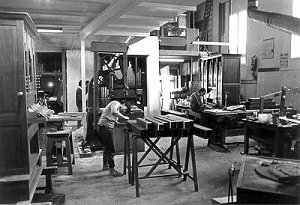 Our work place is a new and spacious shop, with a specially designated area for restoration, an organ pipe workshop, as well as a 17-meter high assembly hall which lets us build and mount very large instruments, reducing the expenses of a long, drawn-out assembly process. That way, we can spend some money on research. 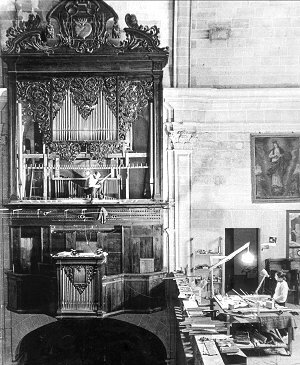 1970: The restoration of the Caimari organ in Sant Augustí, Palma de Mallorca. In the centre of the façade Gerhard Grenzing examining a pipe.